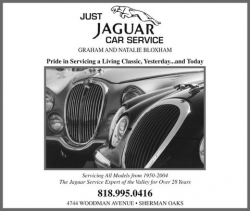 Just Jaguar, a well established and fast paced 10 bay shop in Sherman Oaks is looking for an experienced mechanic. Jaguar experience preferred but is not required. We use John Bean tire mounting, balancing and alignment equipment. Send us your resume and work for a company that has been servicing Jaguars for over 40 years.